Hi, In this making of I’ll explain the process behind the “Deep One”. It is a creature design based on the description of what H.P. 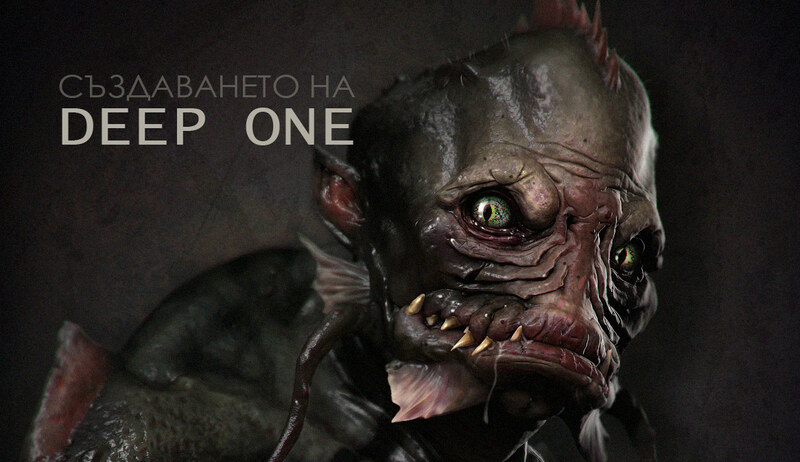 Lovecraft calls a “deep one” in his novel “Shadow over Innsmouth” and it is made for Bryan Wynia’s cg course. Before we start I want to mention few things about the course. It was a blast ! Bryan definitely have a unique lay of working and did put a lot of effort in his course. The three weeks of creature creation , following his instructions and videos were amazing experience…and the best thing is that I heard he will update it soon with ZB4 R2 stuff and more. I recommend it to everyone that have interest in designing creatures and wants to bring their game to a higher level. Knowing the subject matter, the first thing to do is a quick reference hunting. Quick is important here because it is wise to start as quick as possible and not spend so much time in reference gathering than actual sculpting. People often procrastinate and spend awful amount of time for their reference, but the true thing is that almost always any image will do the work, at least for the beginning. So I spend half an hour to collect few photos and started sculpting right away. Because I was quick in the reference stage this saved me extra time for analyzing and observing the photos that I found. I did couple of sketches of different fishes and sketched some details from the rest of the photo reference that I found interesting.This helps me to get familiarized with the subject and to start thinking. For instance , details from the blue-eyed fish from the ref sheet made there way in one of the speed sculpts, particularly the protrusions below the its mouth. The curves of the crocodile’s mouth in the upper left from the ref sheet was used in the second sculpt, the eye image served as a texture for the eyes in the later stages and so on. For the speed sculpts we were provided with a simple basemesh of a human bust. It has the right topology and loops for easy sculpting and at the same time was simple enough and not constraining in any way.I don’t recommend starting with well defined and dense basemesh because it can lock you in the forms already established. Free resource on the horizon! 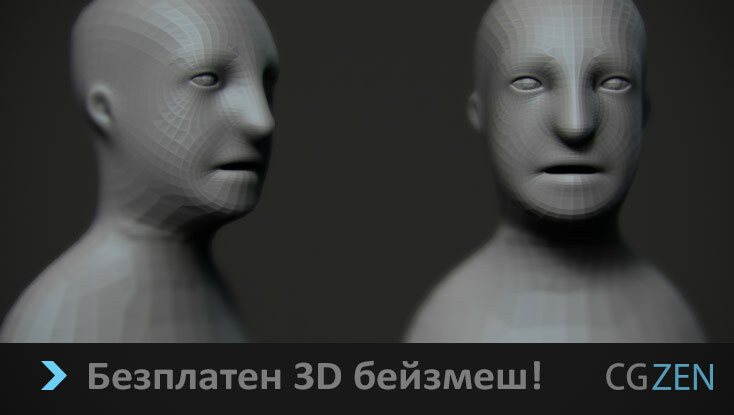 Download a 3D basemesh, which you can use for your own designs. To download the 3D in .obj format, please register for email notifications. All of our email subscribers receive special attention and besides news, only ones (only they, no one else) receive bonuses and content like this one. Въведи името и е-мейлът си, за да получиш линк за безплатно сваляне на бонус съдържанието. Enter your name and e-mail to receive link for free download of the bonus content. Вземи своя download линк! Get you download link! 1) Don’t rush to subdivide the mesh too early on in the beginning but play with the silhouette slowly. Concentrate on the silhouette and the gesture first and establish them by using the move brush on the lower subdivision levels. Don’t move on until you are happy with it. When you come up with something cool than it is time to subdivide further and to continue to add volumes and secondary shapes.Now it is important not to screw up the silhouette you crafted earlier on, lay lumps of digital clay slowly and methodically.Lowering the z intensity might be a good idea so you don’t add or subtract from the sculpt too rapidly and eventually destroy the silhouette. 2) The second important thing is to break up the symmetry early on. This is so important and will give life to your sculptures,eventually they will start looking more natural. Don’t be afraid to do it and don’t save it just for the details at the end, turn it off early on. Here is an example, the sculpture on next page is by Bernini and it’s called “Bust of Cardinal Scipione Borghese”. I’m sure you can recognise which one is the original, but to give you a hint the image on the left looks more natural than the one on the right. Why? Because in traditional sculpture there is no automatic symmetry. The term derives from ”thumb”, and the philosophy behind it is, that it needs to be little, no bigger than your thumb, so it would not take much of your time. They are an instrument, which allows more time to study your possibilities, before you invest a lot of time into something that might lead to the wrong direction. Using the liquify, puppet warp and a simple round brush, the aim is to generate different ideas and push the design as far as possible. This approach is very suitable for people with stronger 3d capabilities than pure 2d painting because you don’t start from scratch, you don’t confront a blank sheet of paper, but rather start with the foundation you did in the previous stage and build on in. At this stage I spend a bit more time searching for more reference, this time narrowing the search not only to fishes and frogs but to other animals and also for color patterns. I started first by varying the proportions and the features with the liquify and the puppet warp. Puppet warp is a new feature in CS5 and with its help I could quickly distort, pose and change the proportions of the characters. Liquify is really valuable tool, not only for varying the features but also as replacement for the eraser tool. Lots of the times it is better to transform , push and pull with the liquify than to erase and start over. 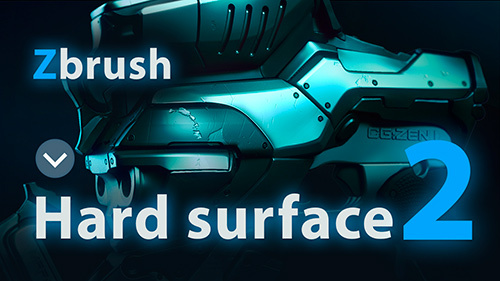 After the little distortion, I use the basic round brush overpaint on top of the base renders.The main point here is to explore and come up with different ideas that you can choose from later than to have many thumbnails that looks the same. Also you may trow up some pattern design at this stage although I didn’t focus on that. Here are the thumbs I did. Initially I really liked number 9 from the image below, but decided to go with 7 because it fit the character description better. On the next part I will turn the the thumbnail into a complete 3d model. Share your opinion in the comments or on the facebook page of cgzen. If you need assistance with a particular part of the process, write to me on info@cgzen.com, so I can help!